Which is why this film is part of every film school's curriculum. 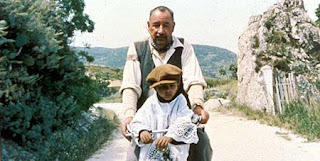 But the English-speaking world knows this film simply as Cinema Paradiso. Most people would read this as the ultimate feel-good foreign movie, and that is where I would disagree. This film is about the death of the analog age, and the birth of the digital age. The movie-going experience of the olden days is gone; the act of watching films as a community, as a social gathering, has been replaced by private viewing in the confines of one's dwelling. The old cinematic traditions are gone, and the best way to relive them is through nostalgia. And this film has no shortage of that. However, one cannot say that the classical filmmaking tradition is better than the modern way. They should not be compared; they are actually one and the same thing. Comparing the old cinema with the new would be like comparing the mop-top Beatles with the hippie Beatles, when they are actually one and the same. Cinema is a continuum; you can periodize it, but you cannot break it down into separate eras. Everything about cinema is beautiful, both the old and the new. One last thing: It is my belief that a good director is one who can direct children. So for that, I heart Giuseppe Tornatore. Nuovo Cinema Paradiso. Italy. 1988.
ashamed to say have never watched the whole film...but i heart you for this insightful comment "It is my belief that a good director is one who can direct children"